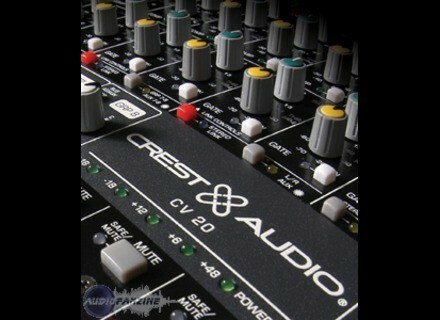 CV-20 48, Analog Mixer from Crest Audio in the CV-20 series. 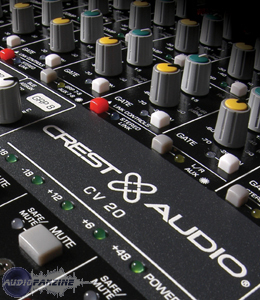 Crest Audio proudly introduces the CV-20 live-sound mixing console, a VCA audio mixing solution designed for applications such as front-of-house, monitors and monitors from front-of-house. The CV-20 is available in 24, 32, 40, 48 and 56 mono input configurations with four-band sweepable EQ and fully parametric mid-frequency control on each mono input. It also features 12 aux sends, eight subgroup assignments and L/C/R panning to the Left/Right and Mono busses. The separate left/right/mono controls can be “fader reversed” to allow fader control of the aux masters. Standard on all CV-20 frames are eight stereo input channels consisting of four microphone-line channels and four dual-line channels with the same assignment capabilities as the mono input channels, plus eight VCA masters and 12 aux masters. CV-20 mixing consoles also feature 128 VCA assignment and 144 mute scenes with MIDI control, 16 mute groups, an 11x4 matrix that is expandable to 19x4, full dynamics on all subgroups and main busses (also routable to the aux masters) and full metering on all main and auxiliary outputs. Available options include meter-bridge kits to monitor all outputs in VU and a bus link module kit for linking together two CV-20 consoles. The CV-20 can use its internal power supply as well as an optional, redundant external power-factor-corrected power supply. 24, 32, 40, 48 and 56 frame sizes. Full VCA control on all inputs and groups. Eight dedicated stereo inputs on all frame sizes. 12 auxes with flexible configuration. L/C/R panning from mono inputs and subgroups. 11x4 matrix, expandable to 19x4. Inserts on all Mono inputs and Main outputs. Optional meter bridge to monitor outputs in VU. LED bar graph metering on all inputs and outputs. Fader-reverse function allows fader control on aux outputs. Full dynamics on all main outputs (L/R/M and subgroups) in FOH mode. Dynamics routed to auxes in Monitor mode (with fader reverse). 16 mute groups, 136 mute scenes and 128 VCA assignment scenes with snapshot automation and MIDI control. Direct outs on all inputs, switchable from pre/post fader. [NAMM] SM Pro Audio PR8DS The SM Pro Audio PR8DS remote controllable multi-channel microphone preamplifier will be showcased at the NAMM 2008.